This drug is used to treat advanced kidney cancer, gastrointestinal stromal tumor (GIST), and pancreatic neuroendocrine tumors. It is also being studied for use against a number of other cancers. 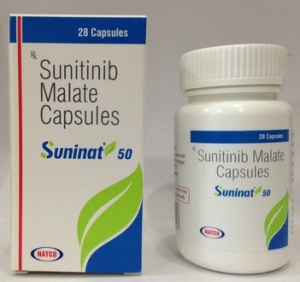 Sunitinib is a type of targeted therapy known as a tyrosine kinase inhibitor. Tyrosine kinases are proteins at the surface of a cell that signal the cell’s control center to grow and divide or help form new blood vessels (angiogenesis) to feed the tumor. By blocking these proteins, sunitinib can help stop the growth of cancer cells.